Howe does he do this every week? Brodie Grundy finished with 17 hitoutsto-advantage, a career-high. His previous high was 14 which he won on three occasions. The Saints have applied 24 more pressure acts and 18 more tackles this quarter. Jack Newnes has gained a gamehigh 766 metres, the fifth-most by any player in a game this season. 16 of Collingwood's 22 possession chains this quarter have originated in its defensive 50. It is from this zone that it has launched all three of its scores. 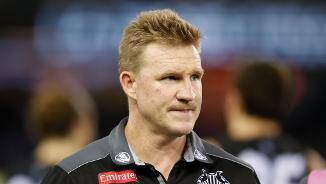 The Pies had recorded a tackle efficiency of 75 per cent this season, the highest percentage of any side. They have recorded a tackle efficiency of just 59 per cent in this game, 11 per cent lower than the Saints. Taylor Adams is up to a teamhigh eight score involvements, three more than any other Pie. The Saints outscored the Pies by 22 points from turnovers for the quarter. 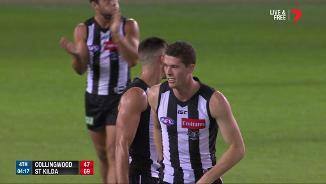 Collingwood continued to hold the upper hand at stoppages in the third quarter, winning six more clearances, but were unable to convert this to scoreboard pressure with both teams scoring seven points from this source. Jeremy Howe has grabbed four intercept marks to take his season tally to 14, ranked No. 1 at the Pies and second in the AFL. St. Kilda has recorded 34 more disposals this quarter with all Saints recording at least one. Three Pies (Alex Fasolo, Will HoskinElliott and Darcy Moore) are yet to record a disposal whilst Scott Pendlebury has recorded just one. Tim Membrey has grabbed three contested marks and recorded five score involvements this quarter, both quarterhighs. No other player has grabbed more than one contested mark or recorded more than three score involvements. St. Kilda has applied 20 more pressure acts and six more tackles inside 50. The Saints have won two clearances this quarter and generated a score from both. Collingwood lead the centre clearance count 21 this quarter with both teams generating one score from this source. Neither team generated a score from this source in the first half. St. Kilda has launched 82 per cent of its score from turnovers, 20 per cent more than its season average. Collingwood has launched just 13 per cent of its total score from defensive 50 this season, the fourthlowest percentage in the AFL. It has launched 42 per cent of its score from this zone in this game. Ben Long may not have won a lot of the ball on debut but he has applied an equal gamehigh 22 pressure points in the forward half. St. Kilda has recorded 20 more pressure acts and 34 more pressure points in the forward half. The Saints won six more intercept possessions and outscored the Pies by 20 points from turnovers. 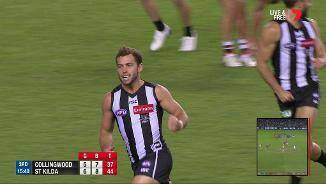 The Pies won the ball at the contest in the second quarter. They won seven more groundballgets, seven more first possessions and six more clearances but scored just five more points from stoppages. The Saints have grabbed seven marks inside 50 this quarter. The Pies have grabbed just two. St. Kilda has generated five scores from 14 intercept possessions this quarter. Collingwood has won 26 more disposals this quarter with all Pies recording at least one disposal. 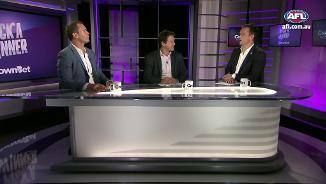 Five Saints (Armitage, Billings, Dunstan, Gresham and Riewoldt) are yet to record one. That behind to Alex Fasolo was his team's first score this quarter from seven inside 50s. The Pies have generated a score from just 44 per cent of inside 50s this season, the thirdlowest percentage of any team. Collingwood lead the clearance count 50 this quarter. Brodie Grundy has won two of these as well as winning two hitouts-to-advantage. St. Kilda has recorded just eight effective kicks this quarter. The Saints have generated three scores, including that goal to Jack Steele, from forward 50 turnovers. Dylan Roberton recorded an equal quarterhigh 13 disposals, including eight kicks at 100 per cent efficiency, as well as winning an equal team-high three intercept possessions. 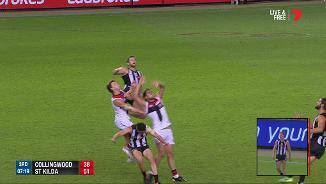 Both teams won five intercept possessions in defensive midfield in the first quarter with the Pies generating three scores (eight points) to none from this source. Ben Reid has won six possessions with four of them coming from opposition disposals. Jack Lonie is yet to record a disposal but that contested knockon (a contested possession) to Blake Acres launched the Saints first goal. That behind to Tim Broomhead was the first score launched from a clearance. The Saints lead the clearance count 74. 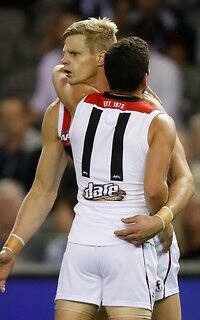 St. Kilda has recorded the last five inside 50s but generated just three behinds from these. Jake Carlisle has won 23 intercept possessions this season, ranked No. at the Saints. His second intercept possession today launched his team's first score. Collingwood has recorded the last four inside 50s but generated just three behinds from these. Magpies InterchangeWill Hoskin-Elliott off due to an injury. That mark to Darcy Moore was just his fourth inside 50 this season. Alex Fasolo's scoreboard impact is 21 points per game this season, ranked No. 1 at the Pies and 17th in the competition. The Saints have generated a score from 64 per cent of inside 50s this season, the highest percentage of any side in the competition and nearly 10 per cent more than the second placed Crows. The Pies have conceded just five behinds from centre clearances this season and are the only team yet to concede a goal from this source. The Saints have launched 10 points per game from centre clearances, the fourthfewest of any team. Welcome to Etihad Stadium for the Collingwood v St Kilda Round 4 clash. 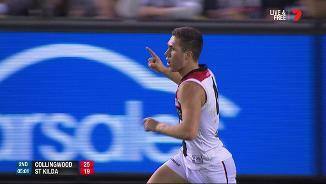 A MISERLY St Kilda has produced its second victory of the season, outlasting Collingwood by 14 points in a gritty arm wrestle at Etihad Stadium on Sunday. After booting 14.23 against the Brisbane Lions last week, the Saints were again inaccurate in front of goal but eventually did enough to separate themselves from a more wasteful Pies outfit. The Saints set up their victory with four of the five goals scored in the third term, doing enough to hold off the Magpies in a scrappy 9.15 (69) to 7.13 (55) win. 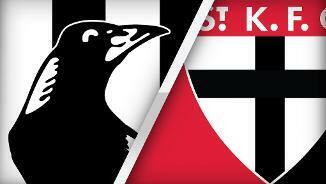 St Kilda's stifling forward line pressure forced the Magpies' defenders to cough the ball up time and again, as they out-tackled their opponents 85-55, but unfortunately the Saints could not take full advantage on the scoreboard. In a game where both sides' defences reigned supreme, inspirational Saints skipper Jarryn Geary was outstanding for the victors. Geary only had 17 disposals, but his ability to win crucial one-on-one contests and trademark bravery to take a hit for the betterment of his team was one of the key elements in the Saints' win. Young Saints midfielder Seb Ross exerted his influence on the contest with 12 disposals in the third term to finish with 36 for the game, while Dylan Roberton accumulated plenty of touches in a setup role across half-back (32 disposals). St Kilda key forwards Tim Membrey and Josh Bruce both finished with two goals apiece, but their influence could have been greater if the Saints' midfielders were more effective going inside forward 50. Saints coach Alan Richardson was pleased with his team's endeavour in the hard-fought contest. 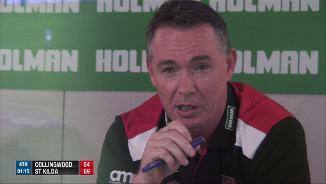 "I think we'd all acknowledge it wasn't an amazing game of footy from a technical or skill perspective – it was a real scrap – (but) it's pleasing a couple of weeks in a row to win when you're not at your best," Richardson said. "Our tackle pressure was really positive and I think everyone knows how strong they were in that space last week. 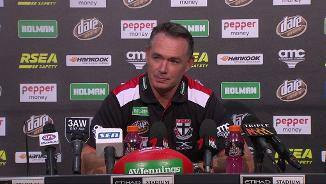 So to win the tackle count by 30 is a real credit to the boys." If St Kilda made scoring look like hard work, it paled in comparison to Collingwood's struggles forward of centre. Lauded for their precise ball movement in a massive away win against Sydney at the SCG last week, that clean, flowing possession deserted the Pies on Easter Sunday. 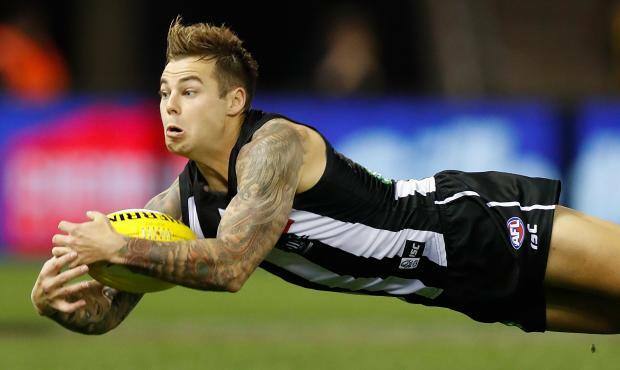 The Magpies kicked just seven goals for the match as their forward line misfired again, highlighted by the ineffectiveness of young forward Darcy Moore, who was again well held. 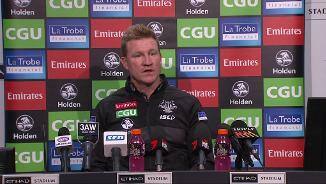 The Pies' scoring struggles are a major headache for coach Nathan Buckley, although the return of Jamie Elliott for his first game since round 23, 2015 was a positive on a day dominated by negatives for the team in black and white. Collingwood gave up 66 inside 50s to St Kilda and lowered its output from previous weeks with just 50 on Sunday. "When you work hard to move the ball forward and you think you're doing quite a bit right and you don't get bang for buck it sets you back a little bit," Buckley said. "Clearly we need to look at our execution going forward, the connection between our backs, our midfielders and our forwards and the balance of our offence in our game. "We weren't going to win with that score." Taylor Adams (39 disposals) typically gave his all for the Magpies, while Steele Sidebottom was also prolific through the midfield. Versatile defender Jeremy Howe stood up under a barrage of pressure, taking a number of relieving marks (10) and finishing with 21 disposals to continue his excellent season. Billed as a match-up between two of the AFL's brightest upcoming ruckmen, Brodie Grundy took the points against Tom Hickey, although the Saints' ruckman fought back strongly in the second half. Eventually the Saints' constant pressure wore the Magpies down, and it was their consistent effort in the third term that sewed up the victory. The loss leaves the Pies with just one win from their first four games. Collingwood: Will Hoskin-Elliott hurt his left wrist in the opening term after contact from Jake Carlisle. The midfielder got the all clear from doctors to continue and he came back on to kick two goals. Collingwood skipper Scott Pendlebury spent large periods of the third quarter on the bench, but coach Nathan Buckley denied there was an injury issue. Tom Phillips (illness) should be available to face Essendon. St Kilda: Key midfielder David Armitage was helped from the field in the final term after pulling up sore from a contest on the wing. Saints coach Alan Richardson said Armitage would be monitored closely during the week: "He got quite sore late and needed to get assisted off right at the end there, so we'll have to see how Dave pulls up," Richardson said. The Saints will again grace Etihad Stadium for another Sunday clash against Geelong, a team they have not lost to since 2014 after a tie and a three-point win in their last two contests. Collingwood will be looking to restart its spluttering season against Essendon in what shapes as a huge Anzac Day clash.